For Performa's upcoming Not For Sale panel, Staging Language, artists Adam Pendleton, Frances Stark, and writer Tom McCarthy will present projects that stage language in material form and ask, "What is borrowed from performance in this work?" Staging Language is also the first in a series of Not For Sale panels leading up to Performa 11, and will discuss one of the key research themes of the biennial, Language, Translation, and Misinformation. Introduced and moderated by Performa curator Mark Beasley. 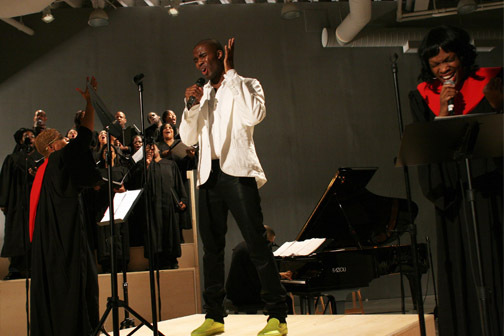 Adam Pendleton will speak on his Performa 07 Commission The Revival (2007), which employed the ecstatic language of gospel, and his recent video, The Band (2010), a film constructed in the manner of a text. Frances Stark will discuss how she pulls snippets from literature, pop songs, and her own writing to rearticulate them in posters, publications, and theatrical lectures. Tom McCarthy will discuss his involvement with the International Necronautical Society, founded by the writer in 1999, which "inhabits and appropriates a variety of art forms and cultural movements," as well as his novels including Remainder (Vintage, 2007). Co-hosted by NYU Steinhardt Department of Art and Art Professions and The School of Art at The Cooper Union. Adam Pendleton (b. 1984, Richmond, Virginia) is a New York-based conceptual artist who is best known for his painting, publishing, and performance projects that investigate the potential of language to shape subjects and re-engage history. Major exhibitions include BAND, The Kitchen, New York (2010); Greater New York, MoMA/PS1, Long Island City, New York (2010); The Generational: Younger Than Jesus, New Museum, New York (2010); Performa 07, New York (2007); Manifesta 7, Trentino-South Tyrol, Italy (2008); Object, The Undeniable Success of Operations, Stedelijk Museum, Amsterdam (2008); Hey Hey Glossolalia, Creative Time, New York (2008); Manifesto Marathon, The Serpentine Gallery, London (2008); and Double Consciousness: Black Conceptual Art Since the 1970s, Contemporary Arts Museum, Houston, Texas (2005). Los Angeles-based, Frances Stark (b. 1967, Newport Beach, California) is a writer and artist. She has presented work internationally at MIT List Visual Arts Center, Cambridge, MA (2010); The Artist’s Museum, The Museum of Contemporary Art, Los Angeles (2009); Nottingham Contemporary, Nottingham, UK (2009); Whitney Biennial, New York (2008); Culturgest, Lisbon (2008); van Abbe Museum, Eindoven, The Netherlands (2007); Learn to Read, Tate Modern, London (2007); and Artpace, San Antonio, TX (2006). Stark’s writings have appeared in exhibition catalogues and art publications such as Artforum, Freize, and Parkett. Tom McCarthy (b. 1969, London, England) is a writer and artist whose work has been translated into more than twenty languages. His first novel, Remainder (Vintage, 2007), won the 2007 Believer Book Award and is currently being adapted for film; his second, C (Knopf, 2010), was a finalist in the 2010 Man Booker Prize. McCarthy is also Founder and General Secretary of the International Necronautical Society (INS), a semi-fictitious avant-garde network of writers, artists, philosophers and political activists that surfaces from time to time via publications, proclamations, denunciations, and gallery exhibitions. Not For Sale is an ongoing public education series presented by Performa that features artists, authors, curators, and critics discussing current issues in performance and new media, and the related task of writing about art and artists whose work encompasses several disciplines at once.